Call us at (315) 422-4712 today! 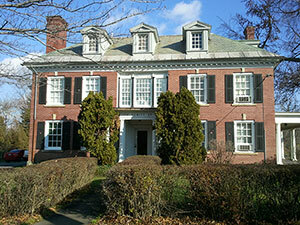 Dr. Vincent Sportelli of Sportelli Chiropractic Health & Wellness Center is pleased to welcome you to our office. We invite all our patients and friends to be informed decision makers and fully understand all health issues you face. That's why we've developed a website loaded with valuable information about muscle, bone, nerve, joint and connective tissue problems, functions and treatments. We encourage you to visit our Syracuse Chiropractor.com site whenever you have questions related to your chiropractic health care. Dr. Sportelli has 27 years experience in providing Chiropractic's natural, effective, gentle and efficient care to the people of Central New York. He is a New York State licensed Doctor of Chiropractic, licensed/certified Clinical Nutritionist, Certified Applied Kinesiologist, Certified and authorized as a TheraLase Laser Center for Cold Laser Therapy Application. Dr. Sportelli uses the world leading, state of the art model TLC-2000 Cold Laser Technology developed by Theralase Laser Inc. He also has extensive post graduate training in orthopedics, back pain relief and neck pain relief, disc and sciatic conditions, sports injuries, clinical nutritional applications and family practice. We also utilize, when necessary, organic nutrients and supplements that are readily absorbable and affordable such as Standard Process, Metagenics, Dee Cee Labs and many other excellent nutritional companies. We make our services available and affordable to all patients. Everyone has the right and the opportunity to benefit from the remarkable results of Chiropractic care. We stock Bio-freeze topical lotion and kinesio tape as well as cervical pillows and other orthopedic appliances. The method of Cupping for musculoskeletal pain is also available and quite efficient for muscle and joint repair. We also administer and employ BEMER wave technology for our patients. This therapy utilizes the Tesla signal creating Bio Magnetic body modulation that increases circulation in the microtubules, capillaries and vessels. This helps maintain the exchange of nutrients and oxygen to support the body's natural self-regulating processes. Scientific evidence confirms that correctly functioning circulation is of crucial importance in ensuring a person's wellbeing and physical performance. This device helps increase blood flow to injured areas and helps accelerate healing in musculo -skeletal injuries and many other body conditions. This method is completely safe and is extremely effective. Dr. Sportelli is a qualified practitioner in Family Chiropractic Healthcare as well as Anti-Aging Technology, Clinical Nutrition, Enzyme Therapy, Sports Injuries, Pain Management and Family Wellness & Preventative Care. We do accept patients on the same daily basis as well as daily walk ins and emergency cases daily. Our Syracuse Chiropractor.com website provides you with background about Dr. Sportelli, our office staff, office hours, insurance policies, appointment procedures, maps, directions to our office and other useful information. We are affiliated Chiropractic providers on all current health programs and insurance plans, managed care networks, medicare and the participating medicaid programs. Our personal pay plans are very affordable, convenient and comprehensive. Of all the gifts we have, it is our belief that optimal and quality health is the most important gift of all. 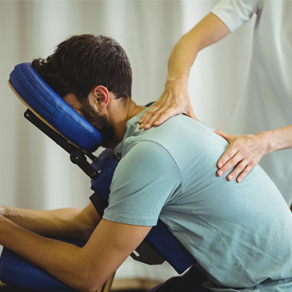 Please take a few moments to look through this website to get a better feel for Sportelli Chiropractic Health & Welness Centers' capabilities and services. We also invite you to email or call us at any time to request an appointment or to ask any questions. As the SyracuseChiropractor.com center we have the lastest in modern technology and equipment for the maximum benefit of our patients. This would include cold laser acupuncture, flexion/distraction back specialist table, and decompression unit for spinal stenosis. We make custom foot orthotics for foot problems of all types including flat feet/ foot pronation and dysfunction ( ie. dropped or high arches, plantar fascitis, heel spurs). These are especially beneficial for runners, golfers and all sport athletes who's performance is enhanced by balance and stability. Dr. Sportelli has been on call and has provided Chiropractic services at the Carrier Dome in Syracuse, N.Y. at the request of Syracuse University AD for numerous events and for world renowned performers including Bon Jovi, Rolling Stones, Neil Diamond, Pink Floyd and many others. Experience and quality care are very important considerations that help build a successful bond and confidence in the doctor/patient relationship. 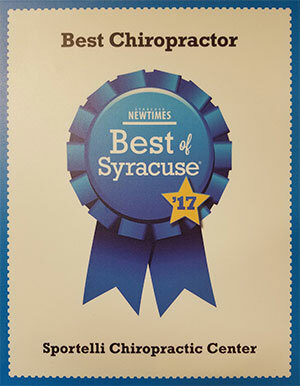 As the Syracuse Chiropractor choosen by thousands of central New York residents, as well as college, high school, professional and amateur sports teams, he has the experience to evaluate, explain and provide successful treatment for your condition. Dr. Sportelli's civic involvement includes Police Commissioner of the Town of DeWitt , Chairman of the DeWitt Parks and Recreation Commission, Board of Trustees of the Syracuse Landmark Theatre, Central N.Y. Cancer Society, Arthritis Foundation and March of Dimes to name a few. He is a member of the NYS Chiropractic Association and is Chairman of the Health Fairs and Education Committee/NYS Fair Exhibit and has been delegate to the NYSCA House of Delegates for ten years. Health is Wealth------ Knowledge is Power You need not fear about your health condition when you know what the problem is and how to solve it with the experienced ability and knowledge you will receive at Sportelli Chiropractic Health Center. Education: Albany State, LeMoyne College -BS Biology, Syracuse University Post Grad study in Bio Chemistry, National College of Chiropractic- BS Human Anatomy, National College of Chiropractic- Doctor of Chiropractic, NYS Licensed Clinical Nutritionist, Certified Applied Anesthesiologist, Certified Meridian Therapy/Acupuncture. Authorized and certified for Theralase Cold Laser. Extensive postgraduate work in Orthopedics, family practice, nutrition and treatment of sports injuries. "Great staff and relaxing atmosphere. The Doctors there know their stuff and can help put your mind and body at ease. I've had strange sharp hip and leg pains and after a few visits I'm feeling much better. Relief for my body and my mind!" "Dr. Sportelli and his staff were so helpful. They were very prompt from the time i made my appointment to my treatments. I would recommended them to any family or friends... 5 stars all the way around. :)"
"Dr. Sportelli has allowed me to be headache free for quite some time now. I used to have daily nagging headaches that often would turn into a migraine leaving me unable to function. For the longest time, I thought I could just keep taking medication to have the pain subside."